Martin Blunos is one of the country's greatest chefs. 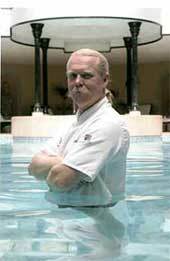 Having held two Michelin stars for more than fifteen years, this blond haired, walrus-moustached Baltic giant of a man has a wicked sense of humour and is a most colourful character. He was born and bought up near Bath, his parents having come to England from Latvia just after the Second World War. Influenced by his mother's wholesome cooking from her homeland and Russian relatives, Martin has today become one of the finest chefs in Britain. In each of his restaurants he earned two Michelin Stars. First was Restaurant Lettonie (French for Latvia) on the edge of Bristol. After nine years, in 1997 he opened a larger version of Lettonie in Bath and added letting rooms. Food writers, critics and contempories were regular customers and Martin's cooking attracts journalists of leading food publications from all around the globe. Unlike many of his peers, he hasn't learnt his craft from other master chefs. He went to college in Cheltenham, did a spell at the Strand Palace Hotel in London, a season in Switzerland and a many cruises on a Greek tycoon's yacht before finding a job at Lampwick's in London's Battersea Road, where the main competition came from Nico Ladenis in his early nouvelle cuisine phase. Martin appears regularly on television and radio with regular slots as Guest Chef on BBC Great Food Live! and Food Uncut, ITV's Saturday Cooks and Daily Cooks, BBC1's Saturday Kitchen with James Martin, BBC 2 Food Poker, ITV 1 Britains Best Dish, BBC Market Kitchen. Channel 5 Cooking the Books. He made 'Tasting Times with Martin Blunos' a ten part series for ITV and was chosen to cook for Her Majesty The Queen during her Jubilee year which was documented in a 30 minute television programme and recently appeared on BBC1 in 'All The Queen's Cooks'. Martin was invited to meet The Prime Minister Tony Blair at the Foreign & Commonwealth Institute to celebrate Latvia joining the EU. He appeared on SKY TV's Worlds Greatest Dishes and has also appeared on BBC 1 Holiday Programme, BBC 2 Master Chef Goes Large and presenting his own Christmas programmes for HTV. Martin demonstrates all over the country at media events and at major food festivals throughout the world. He will be appearing with James Martin at the BBC Good Food Show in Birmingham December 2007. In addition to his cooking Martin is much in demand for public appearances, talks and demonstrations, he was recently a guest chef at the Gourmet Food Festival in Johannesburg, South Africa and has returned from Mexico where he attended and consulted for a new food event organised by the British High Commission. Martin was a consultant to the food operation at the exciting new Thermae Bath Spa in Bath which opened in summer 2006 and has just returned from the Gourmet Food Festival in Capetown, South Africa. 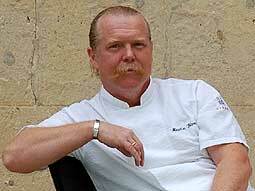 Martin lives in Bath with his wife Sian, a trained chef herself; food writer and published author. They have two sons Leon and Max and beautiful daughter Coco and in his spare time Martin is a born again 'roadie' to Max's rock group Zilch . . .